Commercial construction in Ireland is back at pre-crisis levels. Tech giants and banks seeking a post-Brexit perch are fuelling demand for office space. But with Ireland building fewer than 20,000 homes a year – half what is needed – workers will struggle for affordable housing. 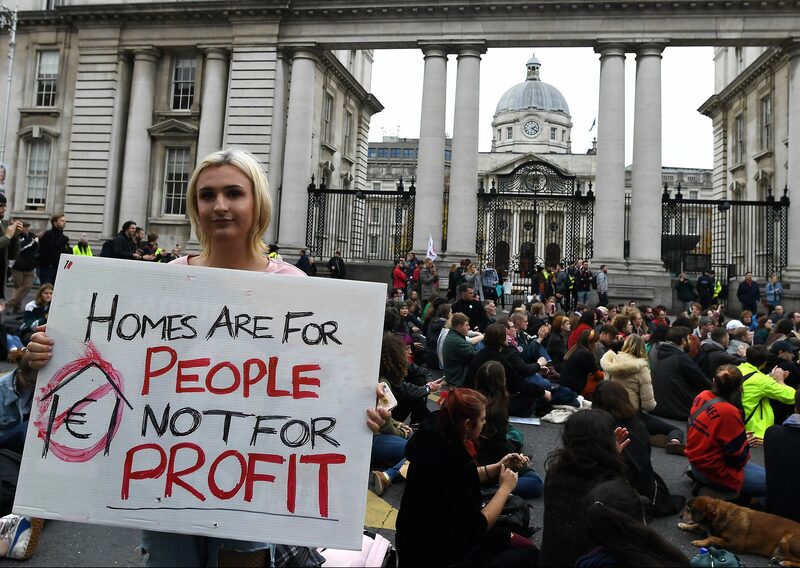 People block traffic by staging a sit down protest at Ireland's housing crisis in a 'Raise the Roof' rally outside the Taoiseach's office at Government buildings in Dublin, Ireland, October 3, 2018. New office space lets soared 3.8 million square feet in 2018, a new record, according to data from property services group CBRE. Residential rents increased by 8.8 percent year-on-year. National rents were 31 percent higher in 2018 than their 2008 peak, according to property website Daft.